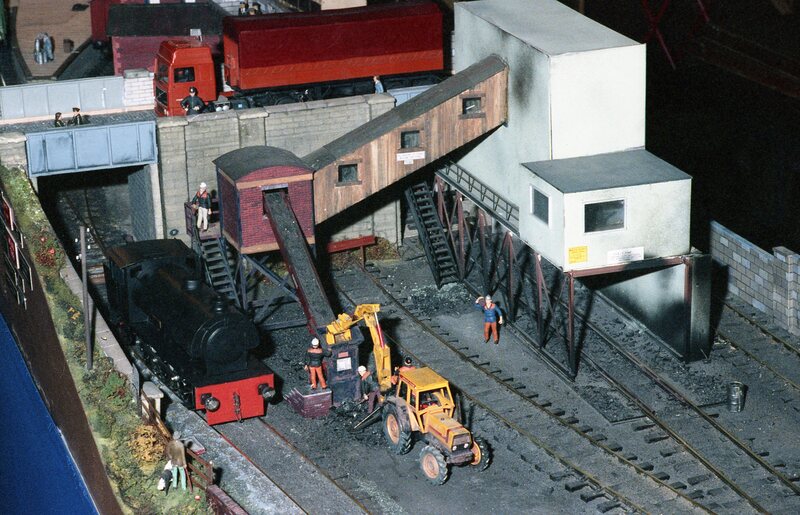 For many modellers the gauge 1 layout that was a turning point in scenic 10mm modelling was my 'Mardy Colliery' built in the mid 1980s. I had become more and more disillusioned with 0 scale and the rapid commercialisation of the scale and wanted to do something more obscure. 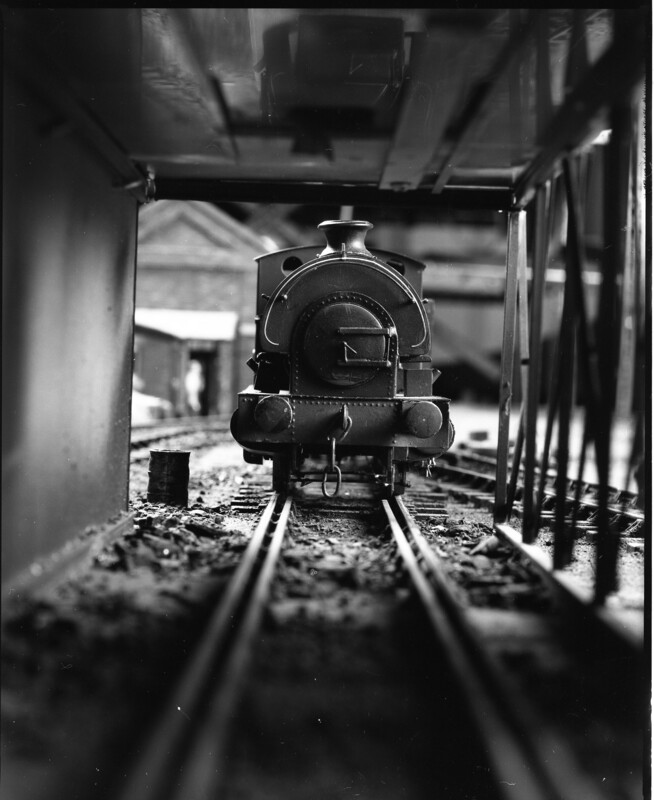 Gauge 1 in those days was principally live steam with a mixture of clockwork and various electrics systems thrown in. 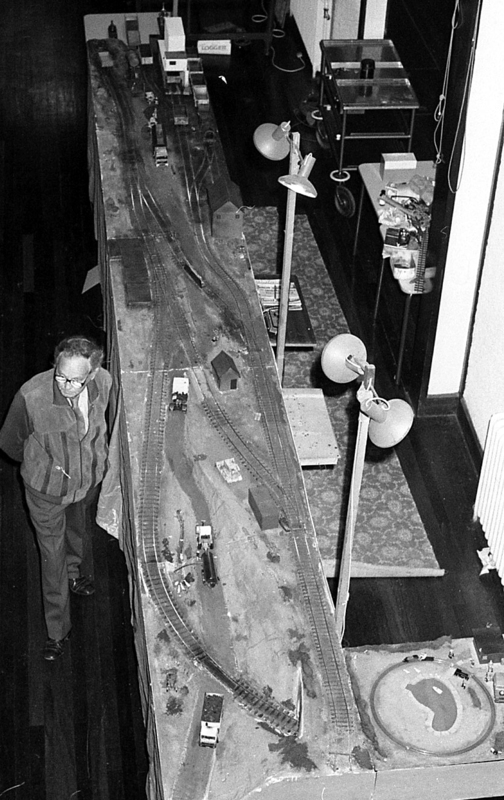 The Gauge 1 Model Railway Association had done an incredible job of promoting the scale and rescuing it from obscurity. 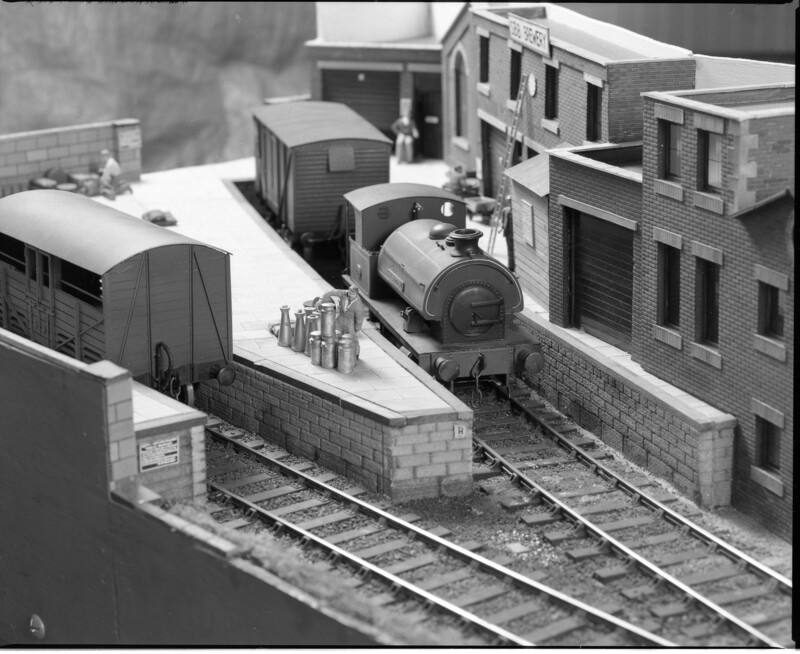 What was needed was a highly detailed scenic layout at 10mm to the foot but with small prototypes and lots of operational possibilities so the obvious route to go was industrial modelling. 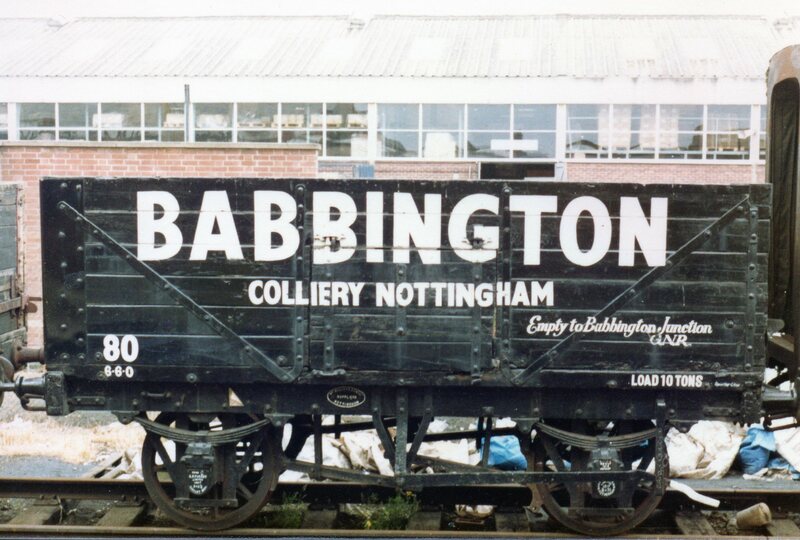 The NCB (National Coal Board) was an obvious choice with its varied fleet of Industrial locos shunting main line wagons. tight curves, steep gradients and a generally run down appearance. 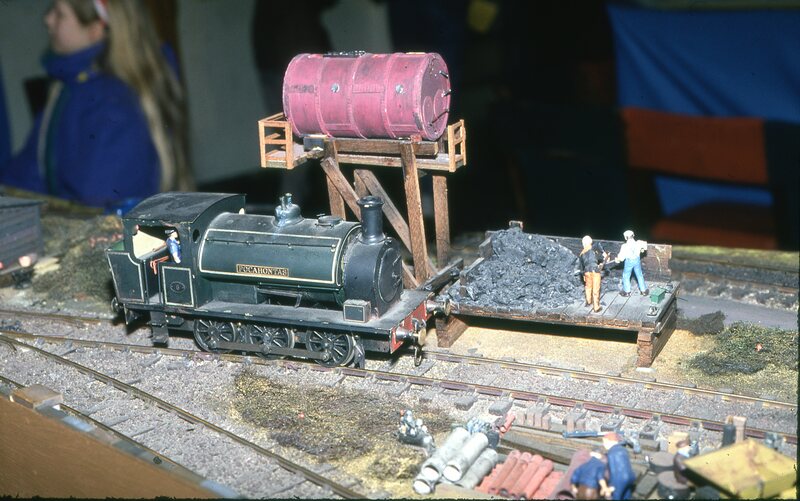 One of the principal requirements was a steep, curved approach to the colliery from the hidden sidings and the requirement to run round to get the wagons into the coal screens. 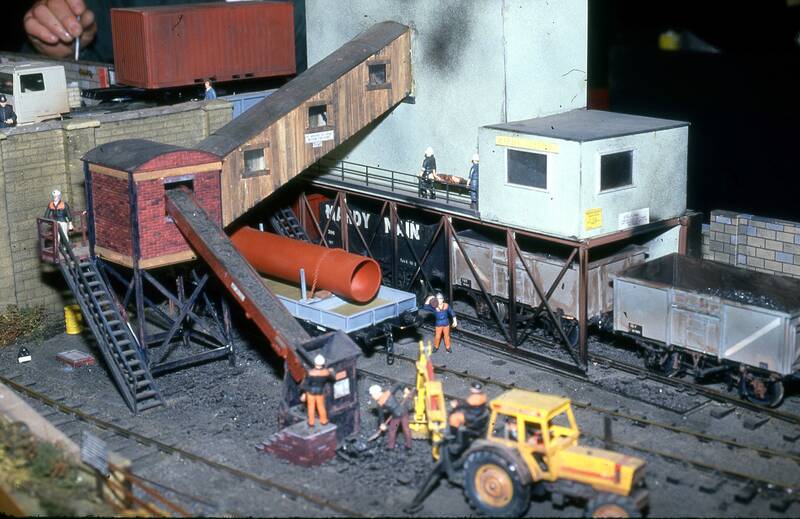 In this way there was no simple run in and run out method of operation, you had to do some serious shunting. 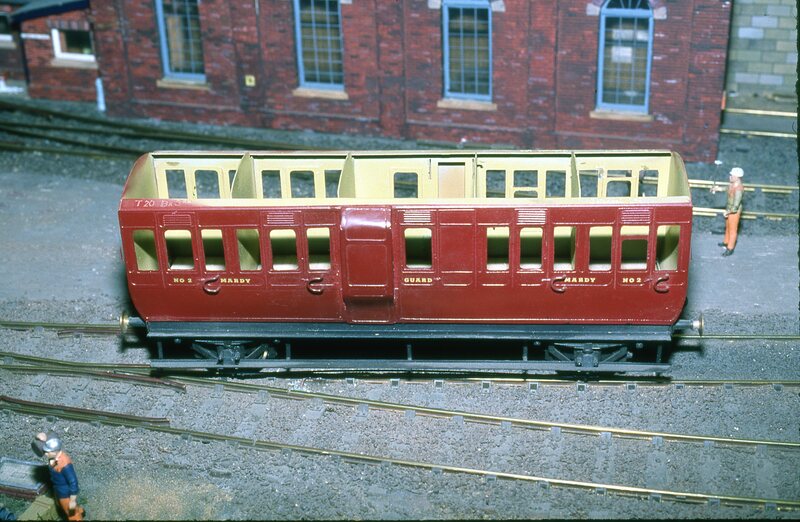 The incline was just guesswork with some test trains proving it would work although there were issues with buffer locking of which more, later. 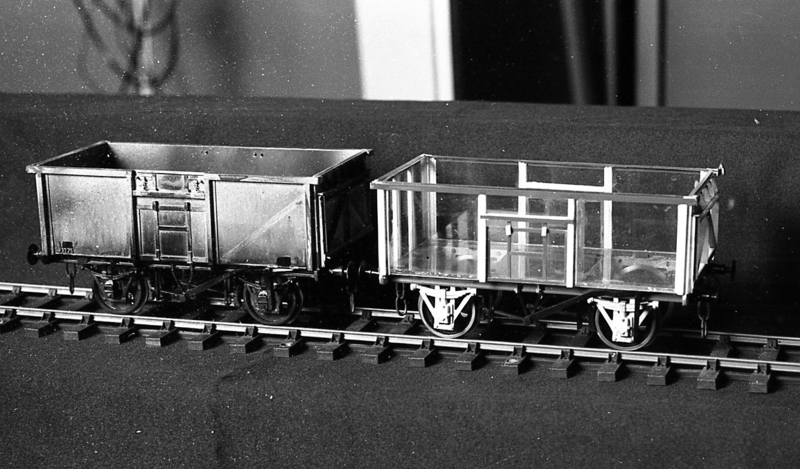 The track up the incline and along the front was Tenmille flexitrack and points and at the rear Marklin points and set track. 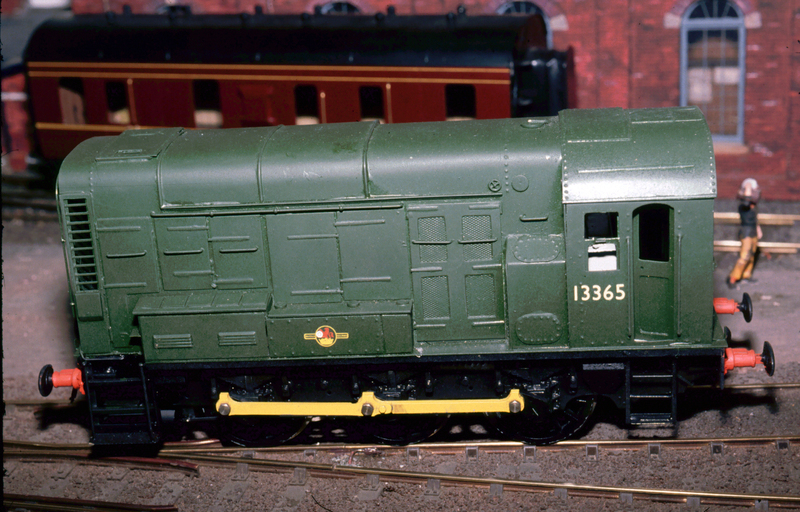 This threw up a problem at the first show as the locos sparked badly when they were running on the Marklin track. This was traced to the cast iron driving wheels mismatching electrically with the stainless steel rail. First show with very bare scenery! 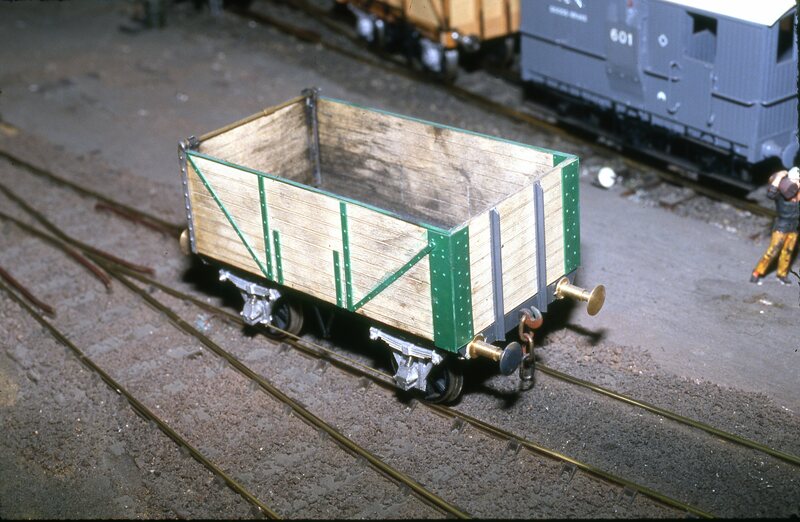 Gauge 1 is a long way from Z Gauge. Looking forward to seeing more. 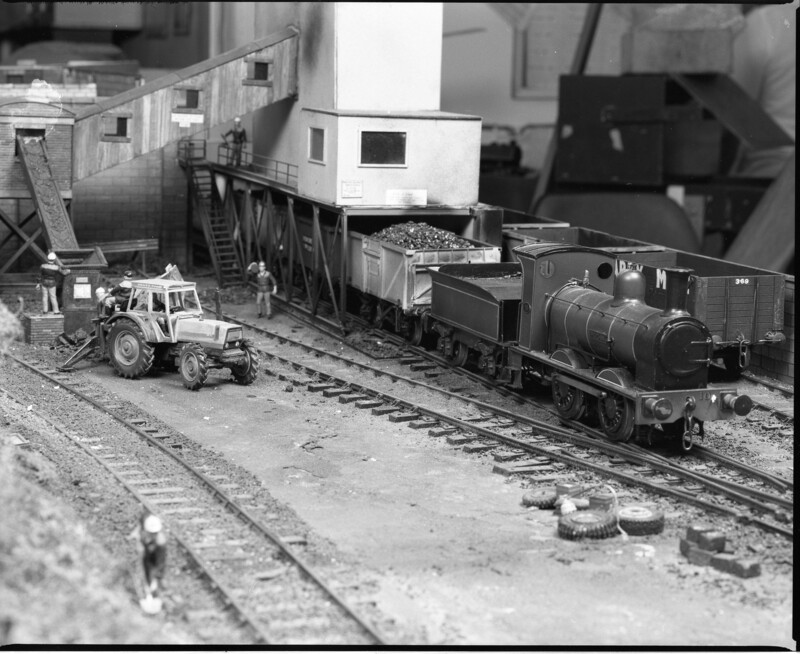 As the next show was looming a rapid relaying of all the Marklin track sorted the problem. 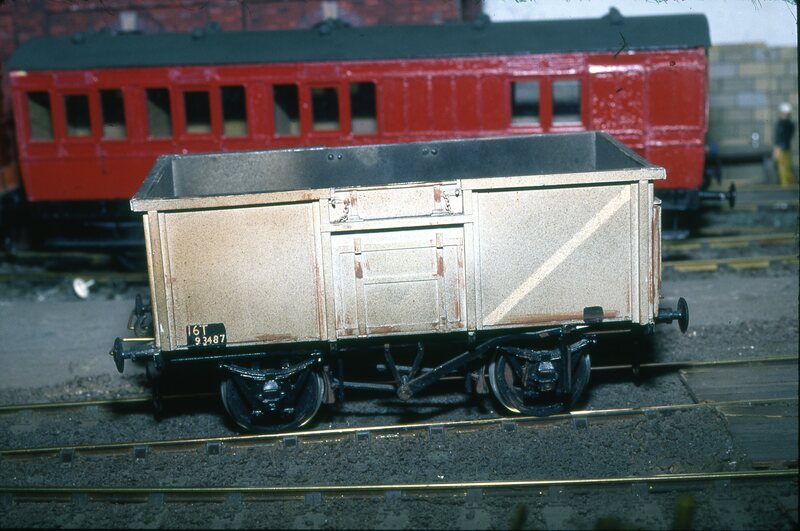 The Marklin points, which were also susceptible to ballast getting into the tie bars and jamming them, were replaced with hand laid ones using copperclad sleepers. 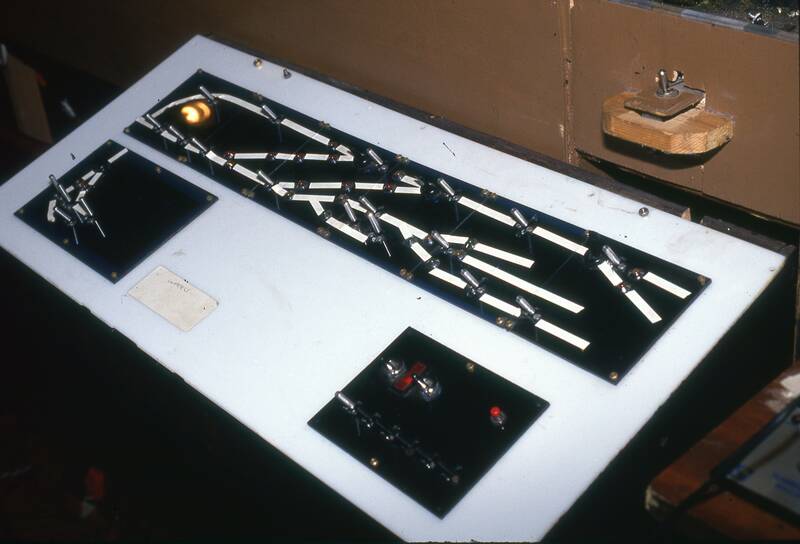 The points at the front of the layout were powered by Fulgurex switch machines and the rear one by wire in tube working off DPDT heavy duty switches. 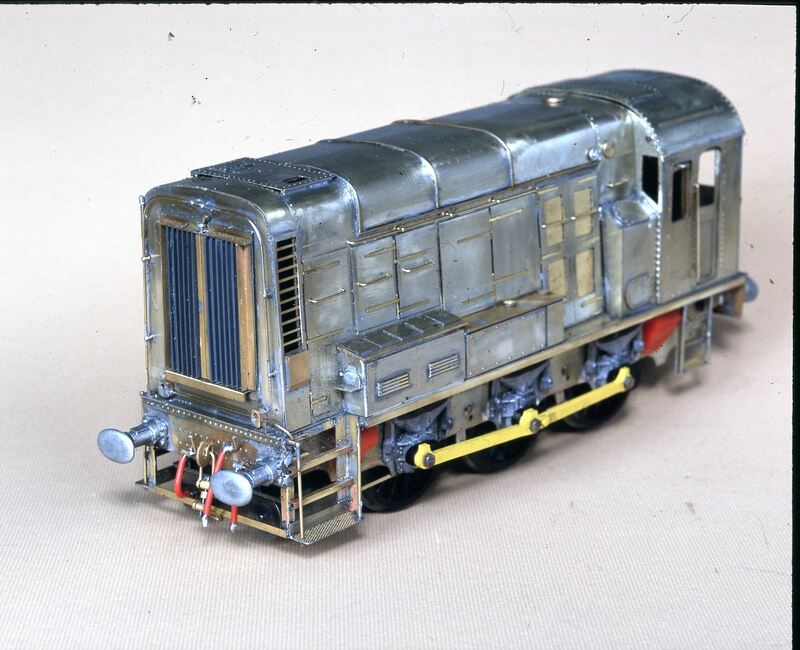 Control was DC in those days with 00/H0 ECM Compspeed controllers just about coping though they did get a bit hot pushing the Beuhler powered locos up the hill. 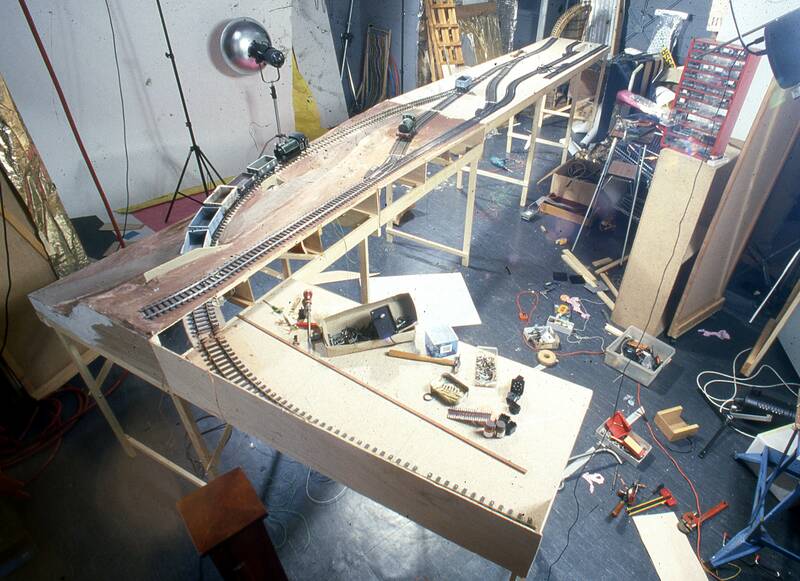 Now the layout was running reliably each baseboard in turn was taken to Jack Burnards for him to work his scenic magic and the control panel refined. 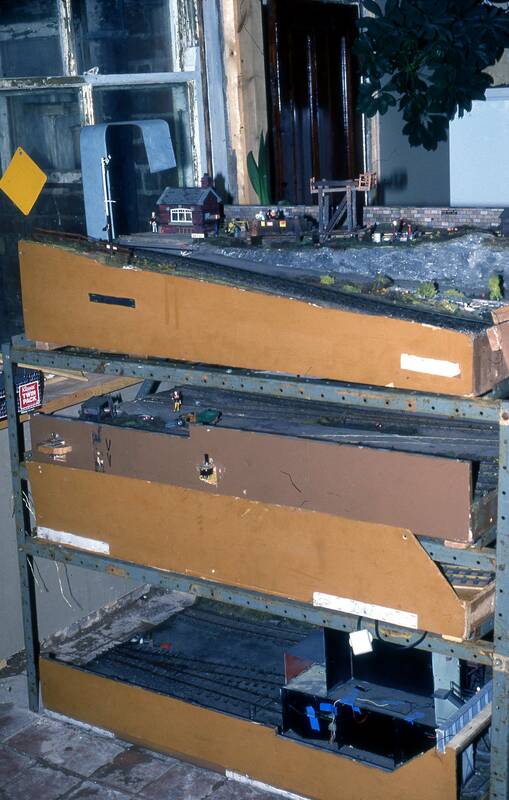 All of the buildings were scratchbuilt in Foamboard and figures and road vehicles came from a variety of sources. Meanwhile the show invites were coming in and a core team of operators were put together. We chose the team name the Mardy Model railway club. 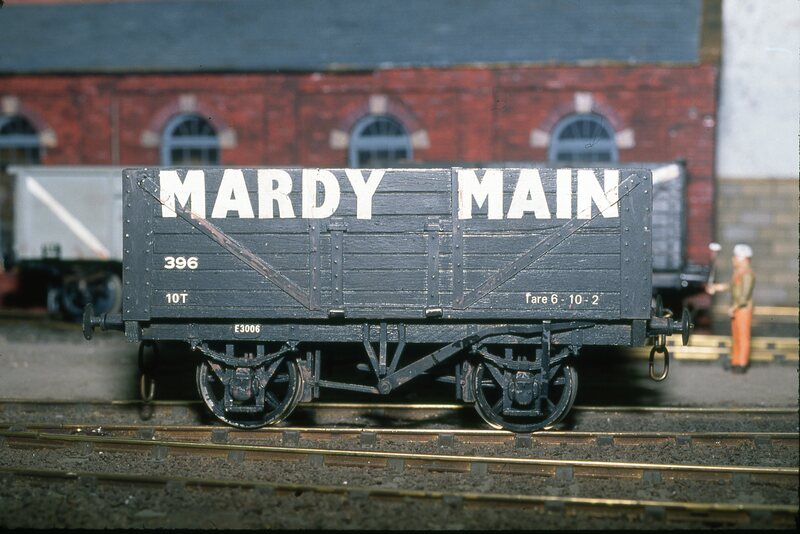 Not because the layout was based on Maerdy colliery in South Wales but because of the Yorkshire meaning of the word Mardy i.e miserable, complaining and grumpy! A colloquial phrase might be ' ignore im, ees a reet mardy bum' pronounce it how its spelt and you've learnt to speak Yorkshire! 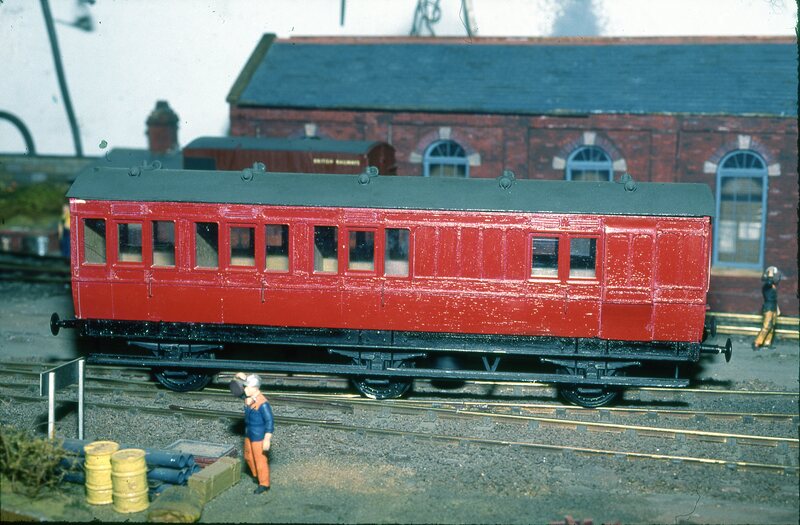 After a few shows Jack suggested we extended the layout by one baseboard so he could model a pub and brewery and I also wanted to extend the fiddle yard so that it came round behind the operators with two sidings available. Each board was 4 foot long giving a total length of 24 foot and a depth of 6 foot at the fiddle yard end. 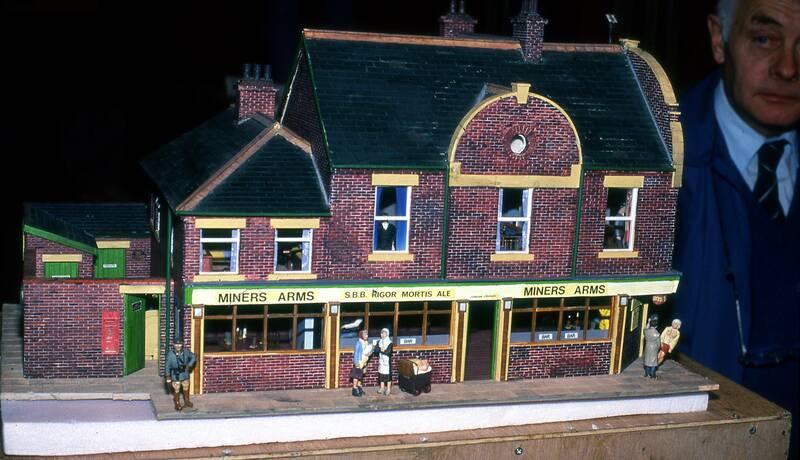 The brewery was named SBB after Smith, Bramley and Burnard and their signature brew was 'Rigor mortis' ale. A good stiff drink. 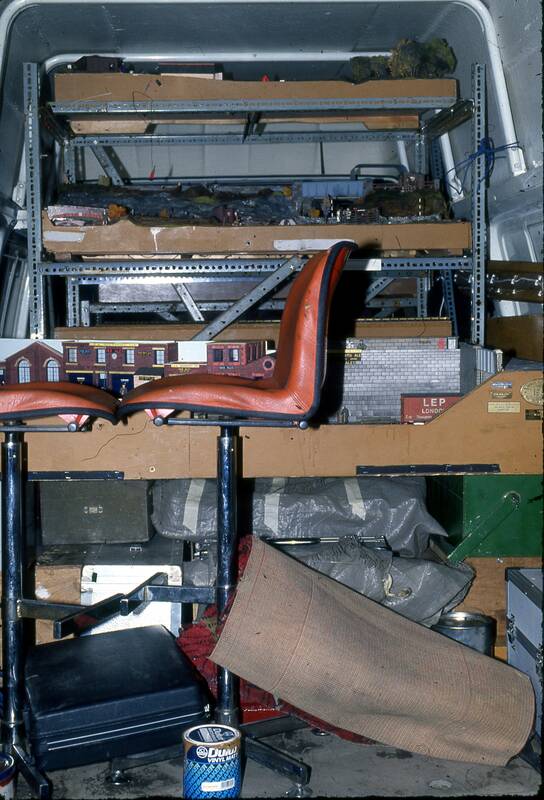 Transport was done in a high roof Transit van fitted with two Dexion racks. Nowadays each board would have its own flightcase on wheels like my Z gauge layouts, one of the lessons learnt lumping Mardy around the U.K! I mentioned the tight curves. 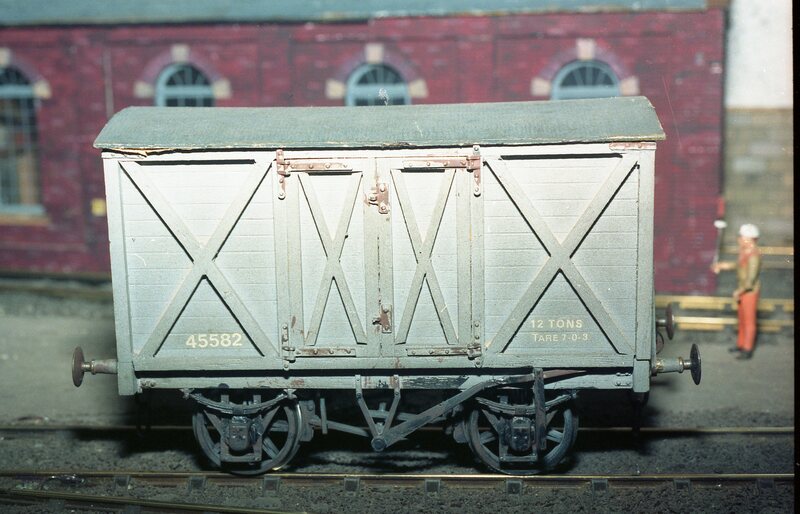 Buffer locking was a problem especially when propelling so thin bars were put across the wagon buffer faces. All of the stock had standard three link couplings. 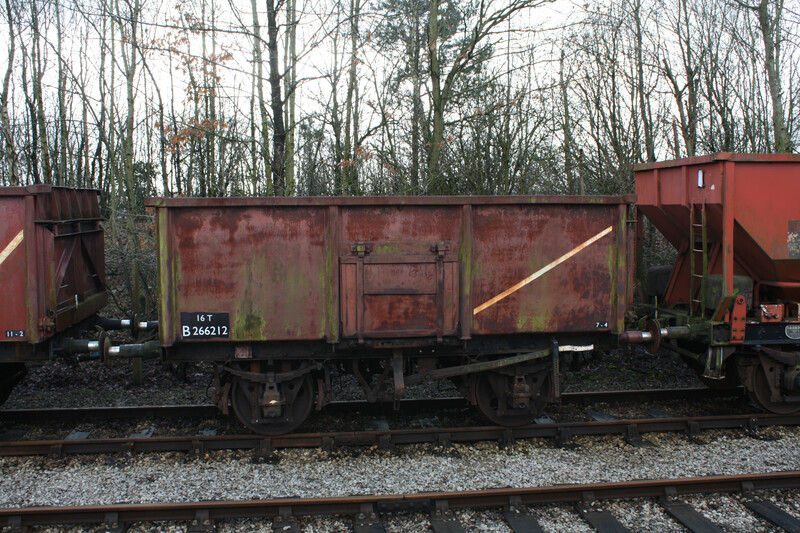 The standard operation was for a short train of empties to be hauled up the incline into Mardy colliery halt. 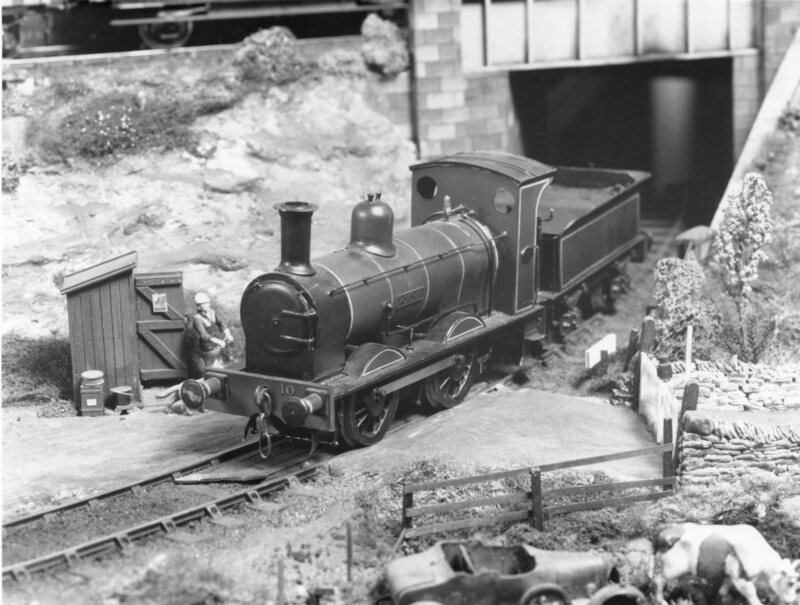 The loco would uncouple, run round the train, drag the train back onto the headshunt and then propel the mineral wagons under the coal screens. 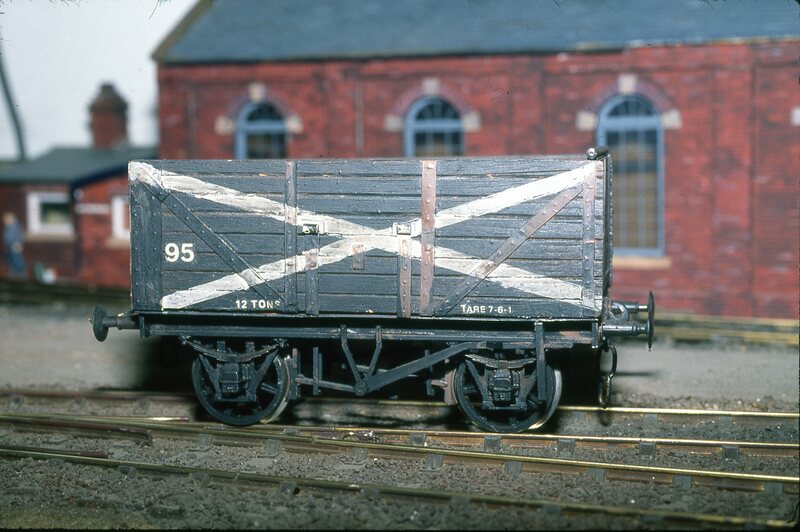 Any other wagons were split off and propelled into the brewery yard. 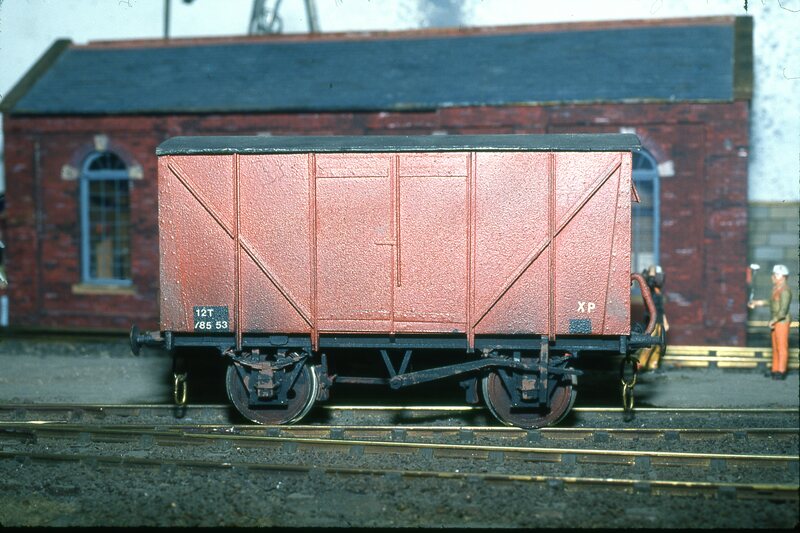 The coal wagons were manually filled with real coal whilst the loco would either shunt the brewery or go into the locoshed. 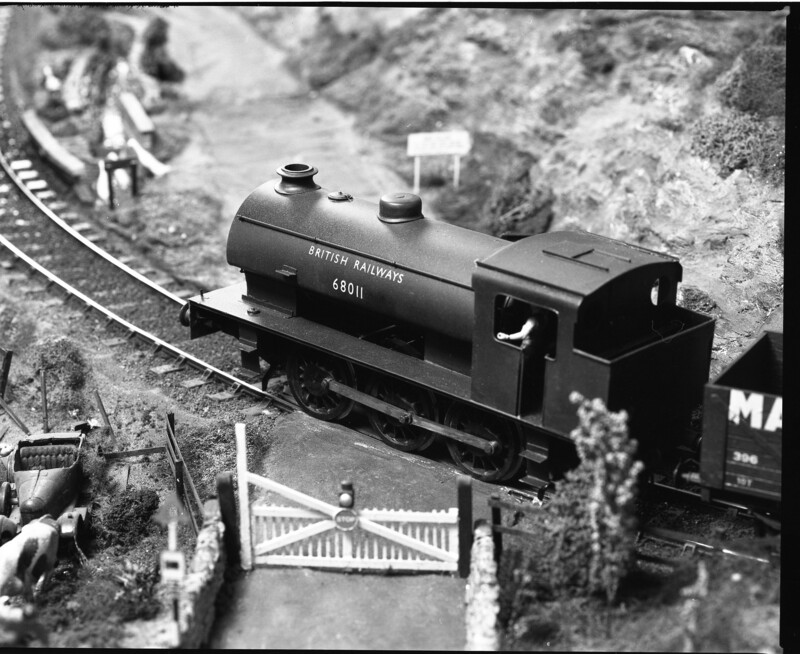 however, sometimes the weight of the train proved too much for the loco on the incline and it would stall so we then did a manoeuvre that amazed the show visitors. 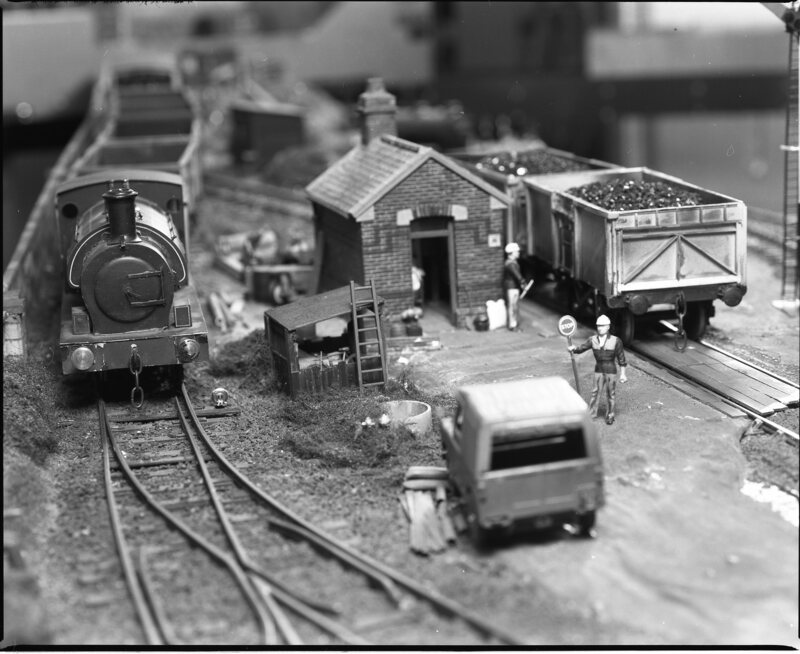 A banking loco would be sent out from the fiddle yard, gently buffer up to the brake van and then both locos would attack the bank. At the top the train engine would carry on whilst the banker would drop off and run back down into the yard ready for its next turn. 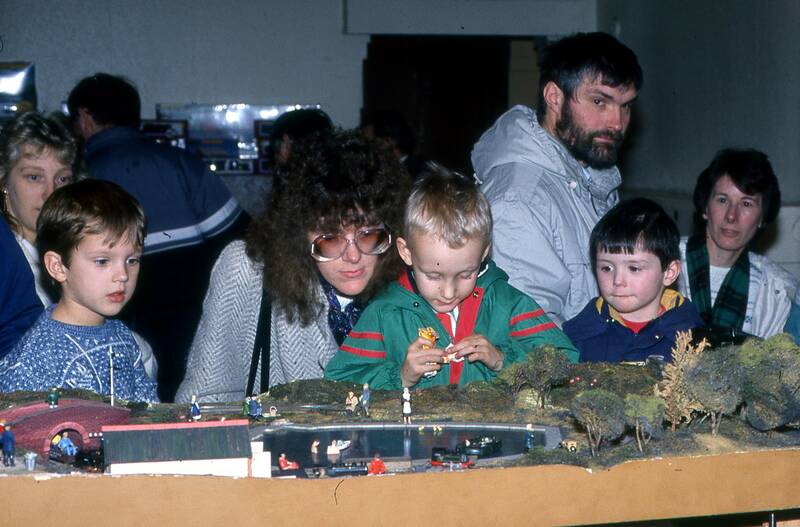 It was a really smooth operation and something many people had never seen before in model form. As operators we really loved doing it! The loaded wagons need no assistance going down the hill although you had to be careful as there was a lot of weight behind the engine. I'll cover the rolling stock in a separate thread. There was a lot of it, far too much really, but once we got the wagon building bug you don't know where to stop sometimes. 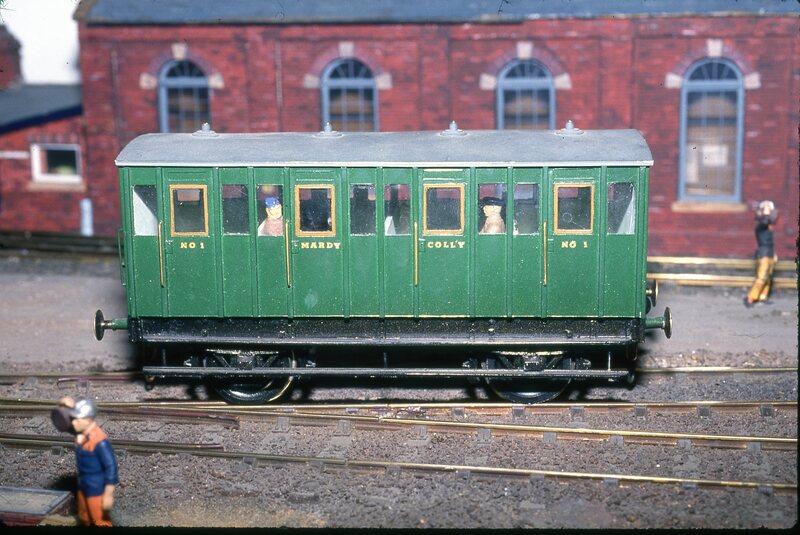 The 'Mardy Dido' was a train exclusively for the miners and was an ancient Highland railway four wheeler later supplemented by some ex Great Western four and six wheelers. 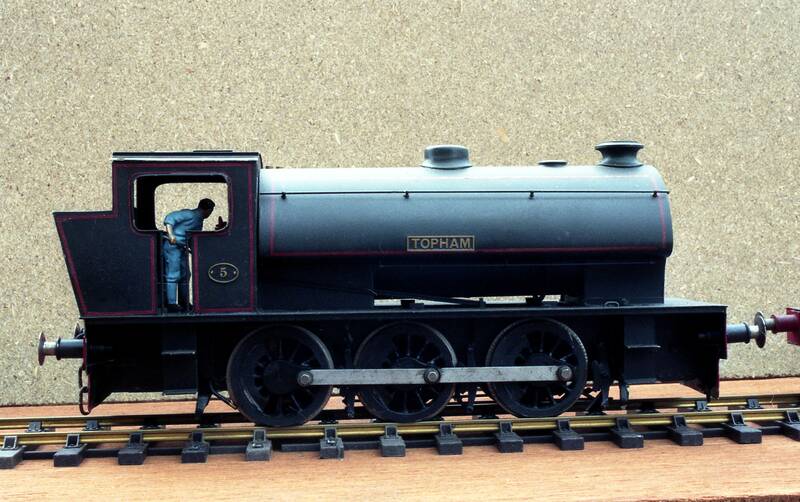 And the locos were covered in my thread on scratchbuilt gauge 1 locos. 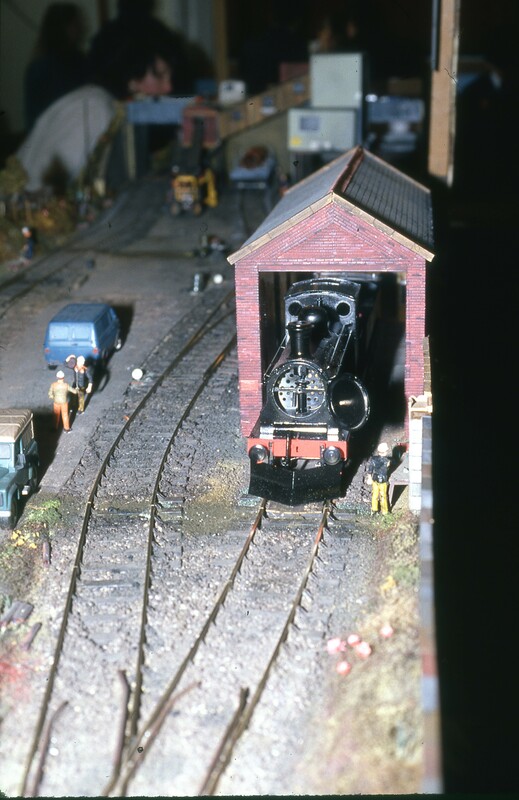 Now the entrance to the fiddle yard was a bit bare and people could see straight into it so a park layout using N and Z gauge to represent 7 1/4" and 5" live steam was built that sat over the bottom of the incline. 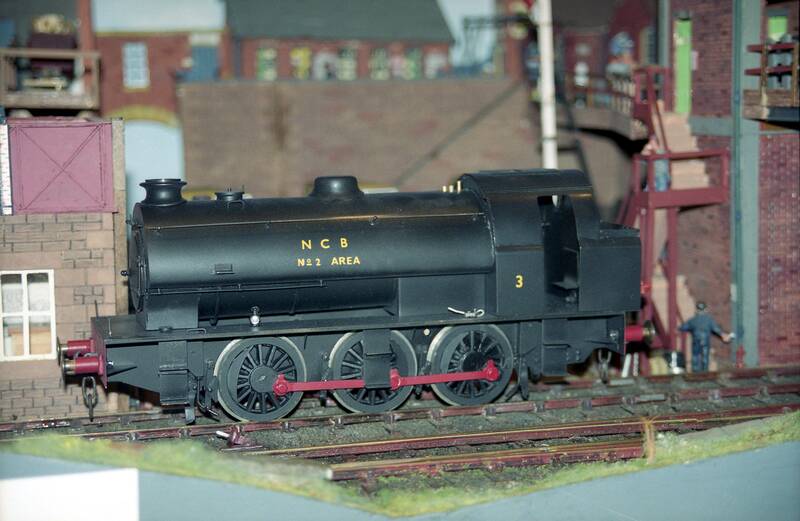 This just ran round and round but meant there was always something moving on the layout. 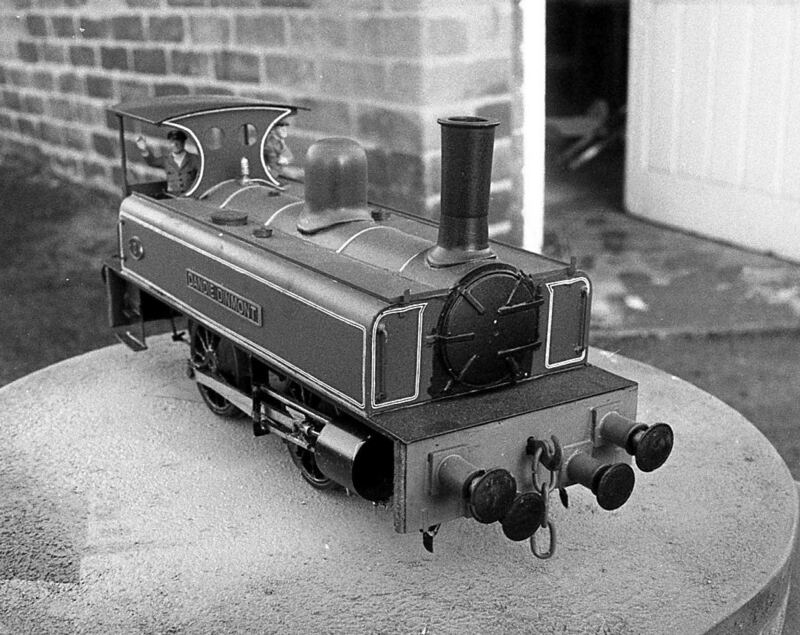 Called Mardy Model Engineers this would eventually have a career all of its own. 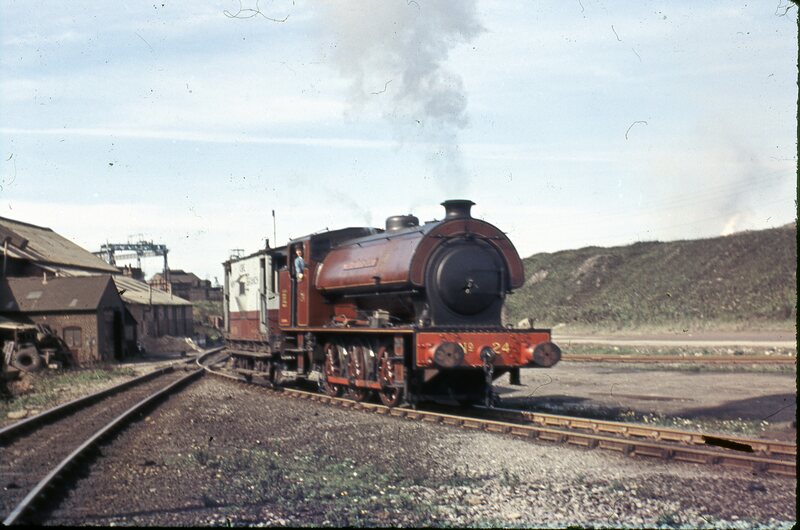 'Pocohontas' a Hunslet 15" 0-6-0ST drifts towards the coaling stage. This had absolutely no chance of getting round the bend and down the incline! So we did a lot of shows but problems were starting to manifest themselves. transporting it was an issue as the layout, and the racks, had to be carried down two flights of stairs and loaded into the van, carried into the show and set up. Worse was Sunday nights when having got out of the show and back to the clubrooms after a long drive we had to lug it all back up those same flights of stairs and it was getting to be too much really. The other issue was more threatening. 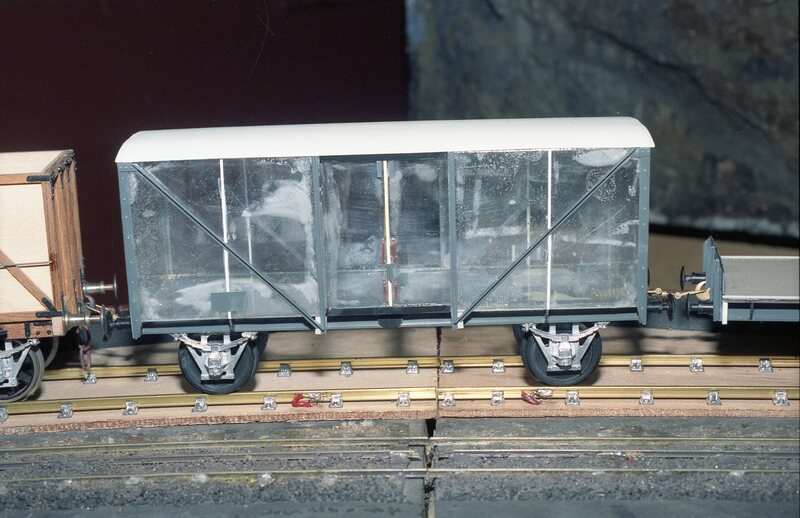 When the Marklin track was replaced the ballast had been soaked in warm soapy water to get it off but four years later the chipboard tops began to sag, slowly at first but as time went by it was getting worse. People complimented us on the realistic bumpy track! Attempts were made to try and shore it up to no avail and the layouts show days were numbered really. 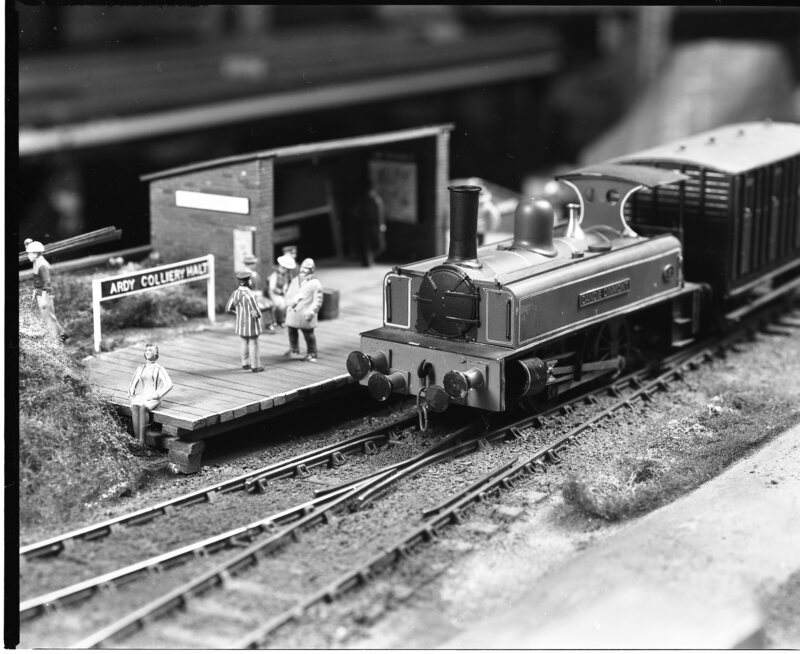 So after 28 shows the length and breadth of the U.K it was sold and as Gottersee and the gauge 3 layout and the Nickel Plate layout were all in the pipeline I sold all the locos and rolling stock as well. I still get asked by show organisers if there is a chance for it to come out of retirement for an anniversary tour but to be honest I have know idea where it is now. 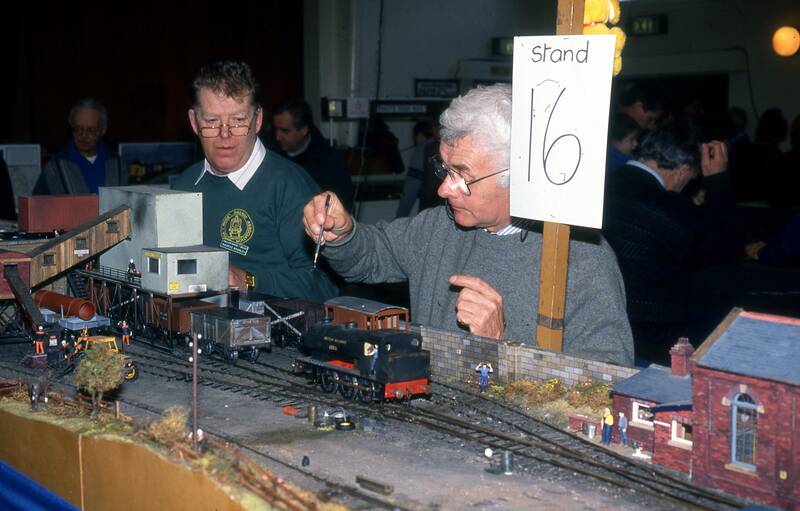 A couple of members have passed away and the rest of us are probably a bit past it when it comes to that sort of intense layout exhibiting now. I never wrote it up for the magazines at the time sadly, nowadays it would be all over the internet! 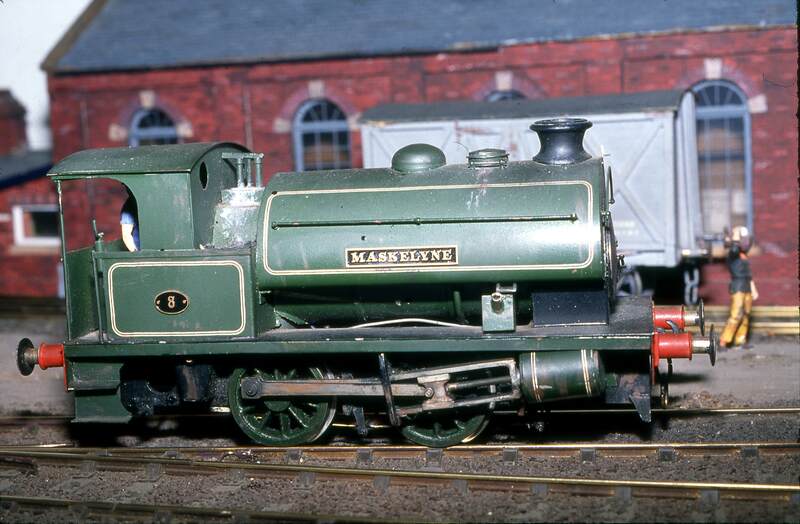 The first loco I built was the Little Stephenson and Hawthorn 0-4-0ST 'Maskelyne'. Constructed in Nickel Silver with a chassis made from GFS Steel. 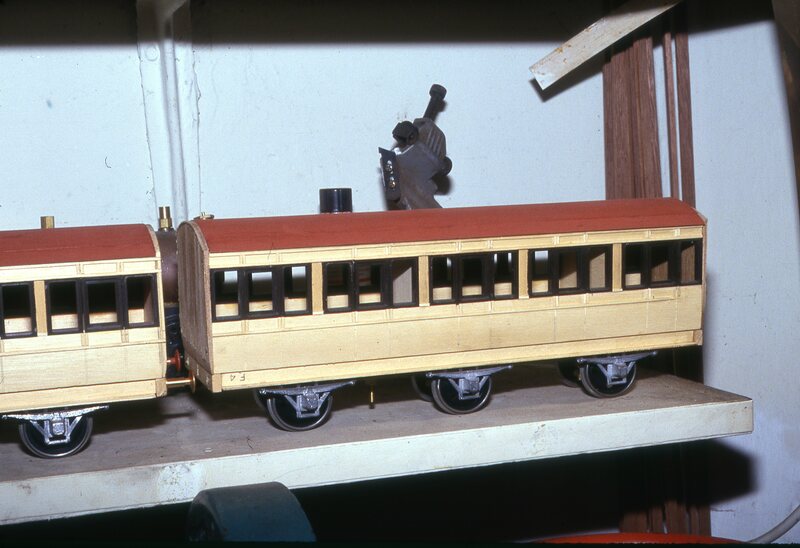 A Beuhler motor powered the rear axle and the loco sat on cast iron driving wheels turned from Locosteam castings. Insulation was done by the split spoke method. A little judicious weathering toned down the paint nicely. 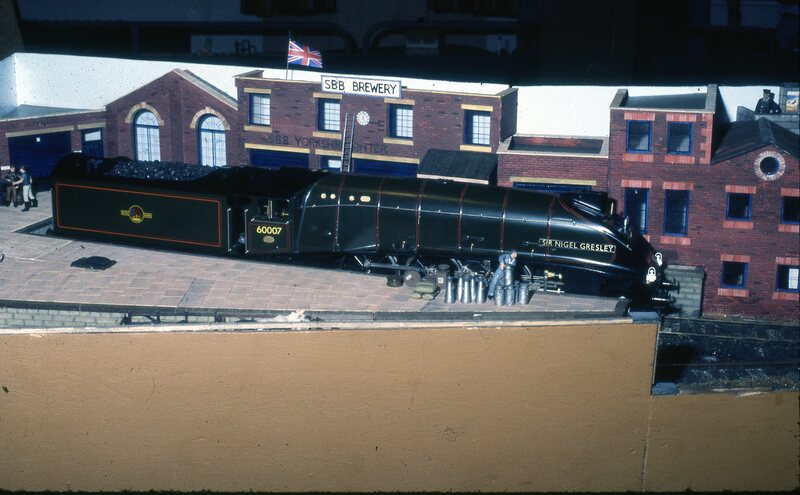 Now the next loco was a weird one! 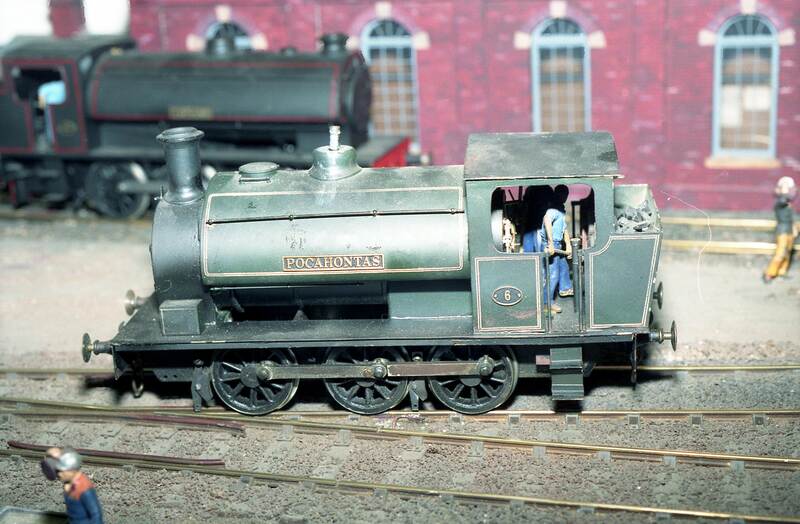 'Dandie Dinmont' worked on :Lord Carlisle's 'Brampton railway' in the far north of England. 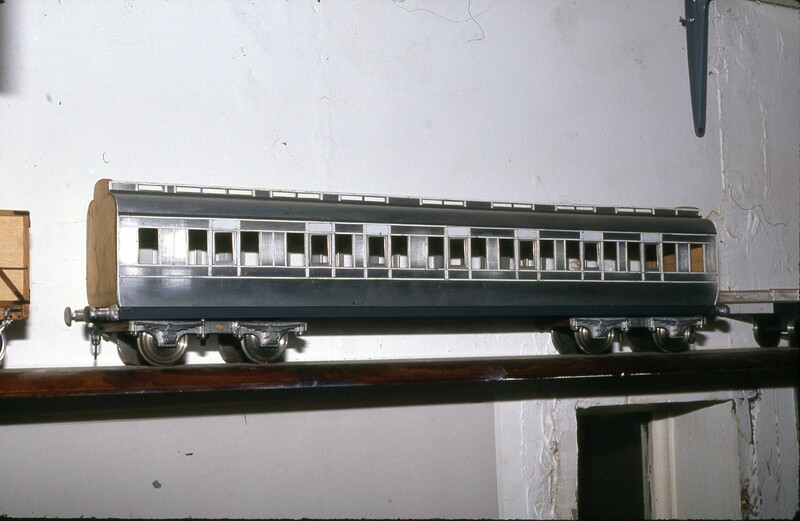 My model shows it in the state it was after a major rebuild complete with its two sets of buffers. 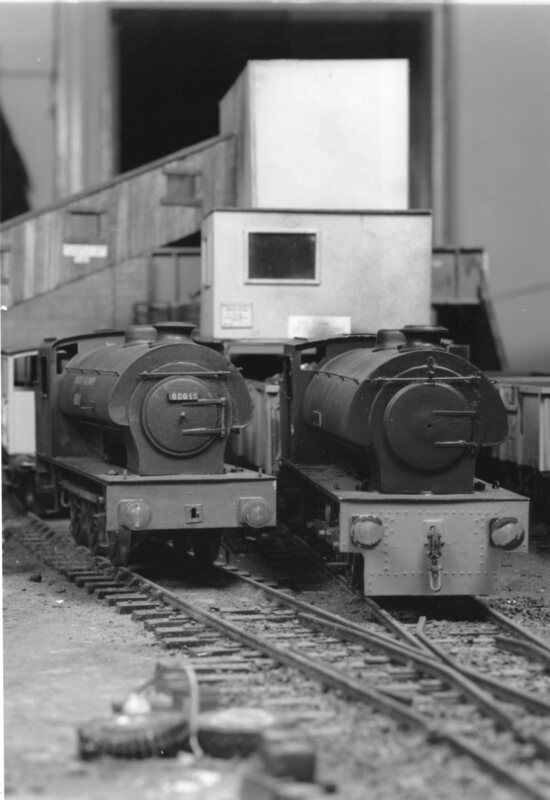 The top two are are at the standard position but the two lower ones were for shunting ancient 'chaldron' hoppers. Now I went a bit mad with the mechanism on this one with a Maxon Coreless motor and flywheel driving through a double reduction gearbox. It ran like a pig! We think the ECM feedback controller and a coreless motor with a flywheel fought each other and eventually it has a Beuhler fitted like the rest of the fleet built so far. 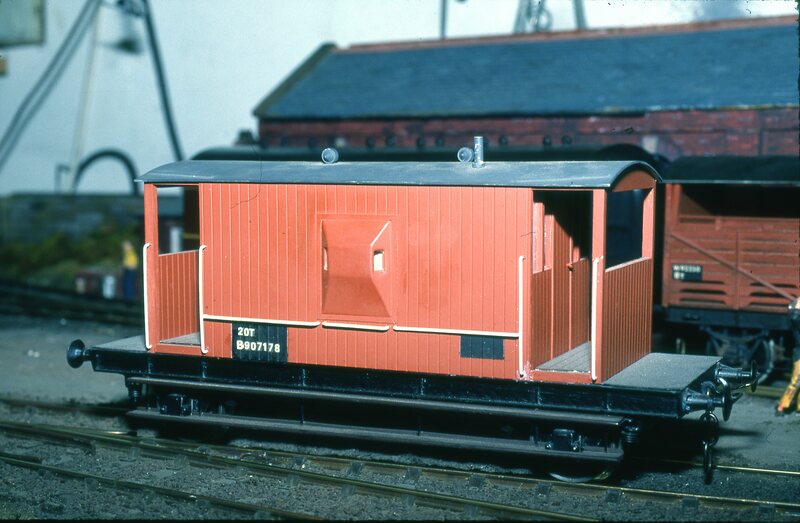 Now the Hunslet Austerity was built in massive numbers after it was chosen by the war department as the standard shunting engine to be supplied during the second world war. 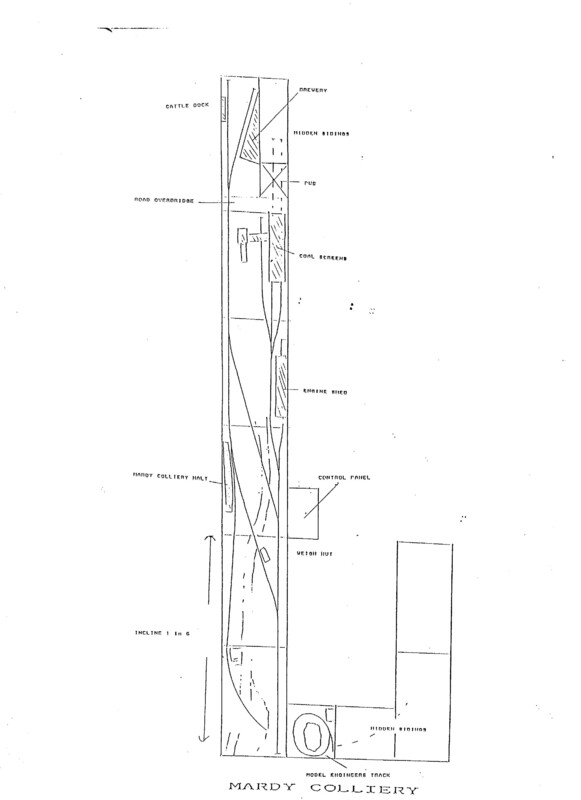 Other Industrial loco builders were allowed to use the drawings and hundreds were manufactured right up to the late 1950s. 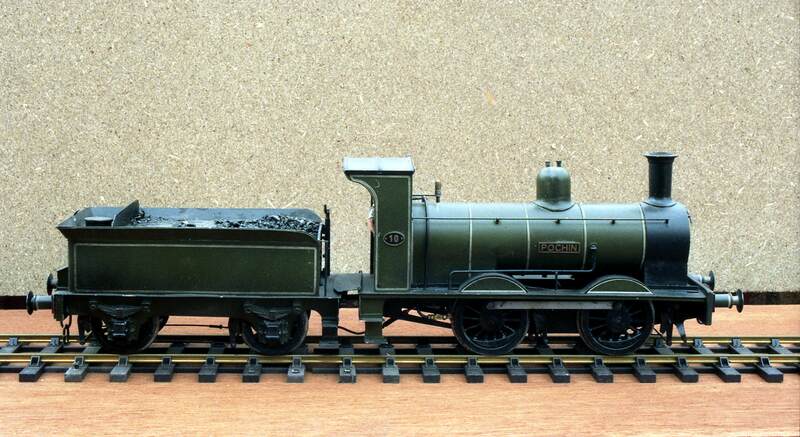 After the war the LNER, who had a desperate motive power shortage, took some into stock and these eventually came into british railways hands at nationalisation in 1948. 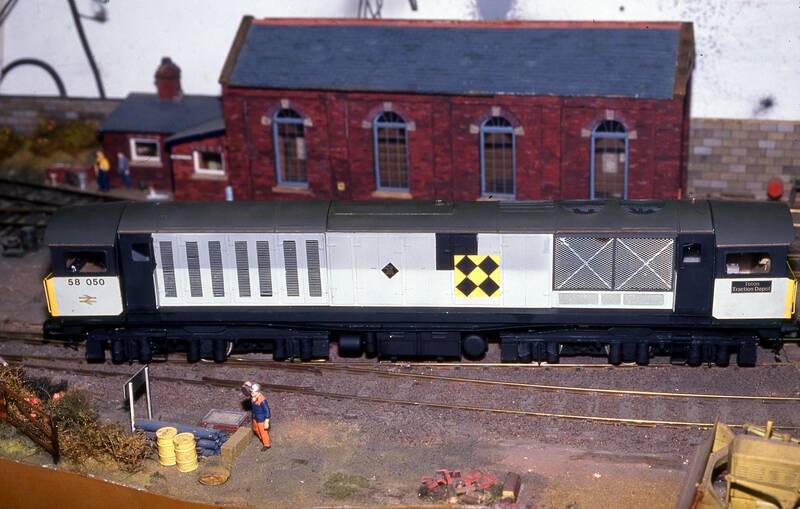 By now Jack was working on his own minimum space gauge 1 layout and needed a speciality Austerity. The 'Lambton Cab'version cut down to get through some tight tunnels. 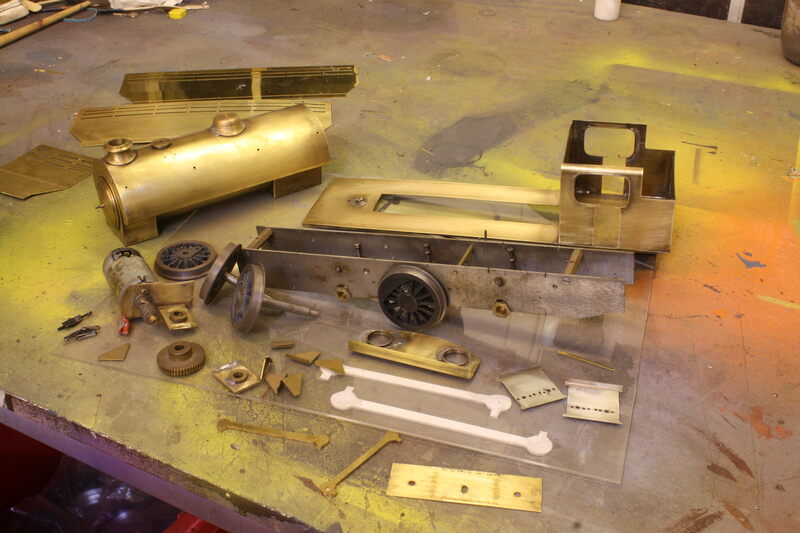 Construction this time was in brass rather then nickel Silver. 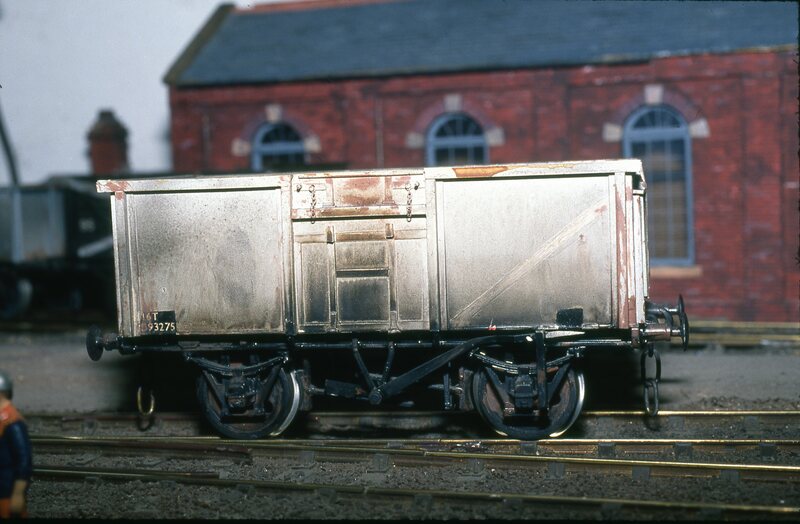 Now before the railways were nationalised in 1948 most colliery yards would have been full of the coal mines own private owner wagons finished in the owners livery. Some coalmines owned thousands. I soon discovered that they need a good couple of coats of black paint to stop the sunlight showing through them! 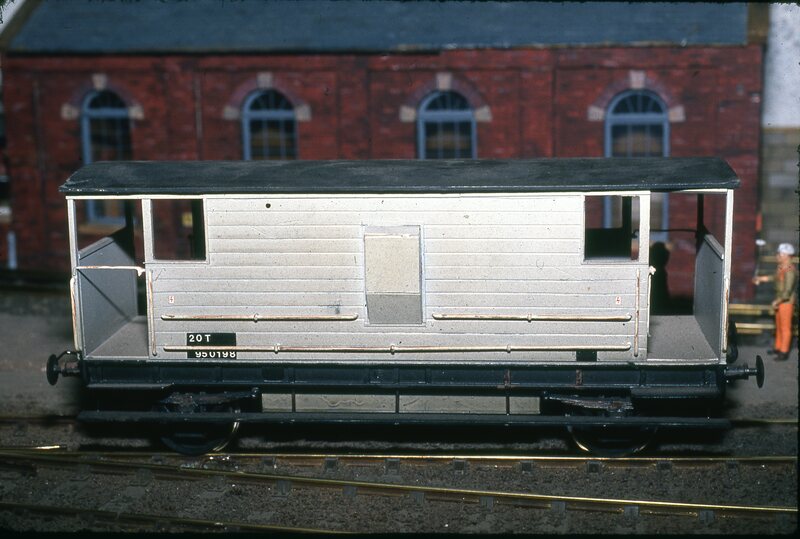 As fish traffic died out these were converted into parcel vans although you do wonder if they ever got rid of the fish smell before loading it up with people's Christmas presents! 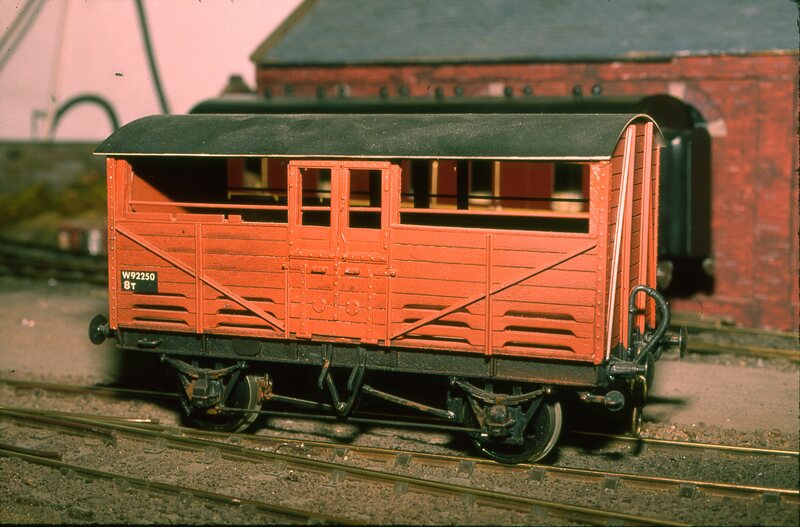 Only short thread this as I never turned out gauge 1 coaches in the quantities I did with freight stock. Relative luxury arrived with the purchase of a longer wheelbase Great Western coach, This was an etched set of sides, memory fails me on who produced them but they weren't very good! 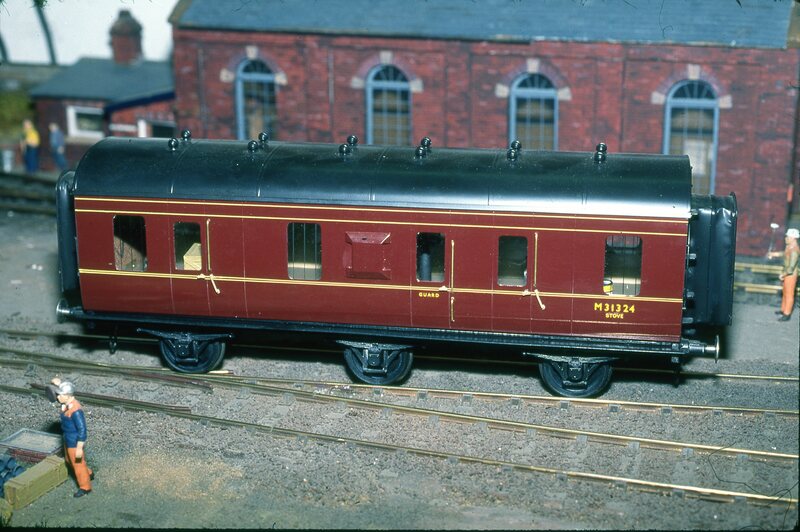 Now the Premier Railways coach kits were very interesting. 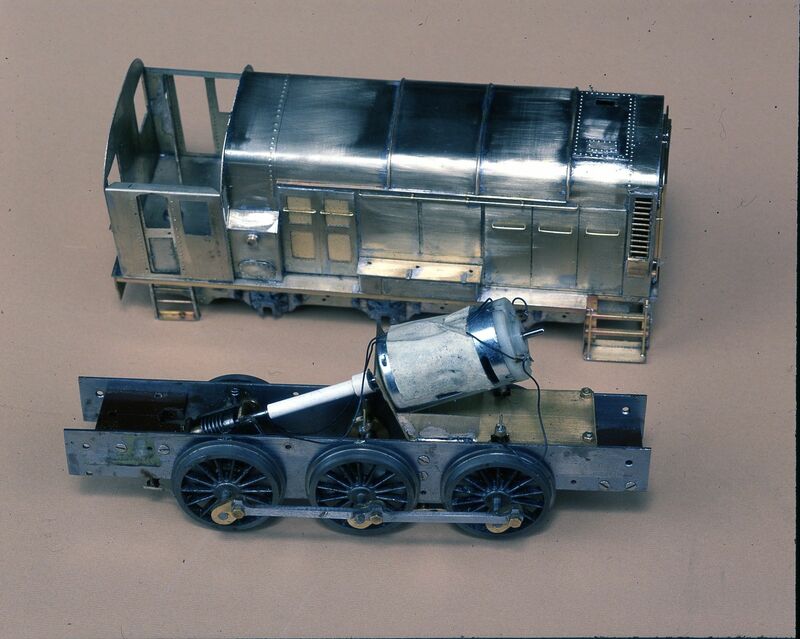 Mike May wanted to do some kits that could be used to make generic Victorian bogie coaches. His team came up with the idea of injection moulded window and door details and profile milled wooden sections for the rest. In effect you could create any configuration of pre-grouping coach you wanted. 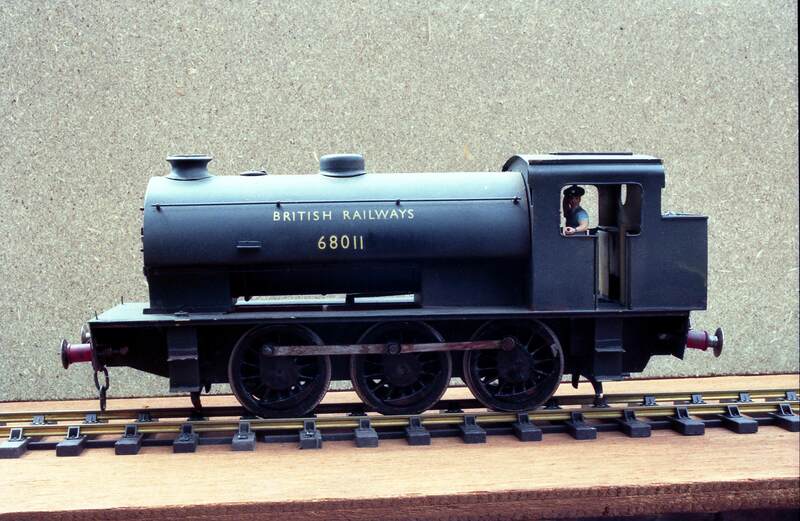 I decided to do a rake of Barry railway six wheelers. In primer. Now I had a choice of how I was going to get these around corners and opted for a 'half bogie' design rather than a Cleminson design. 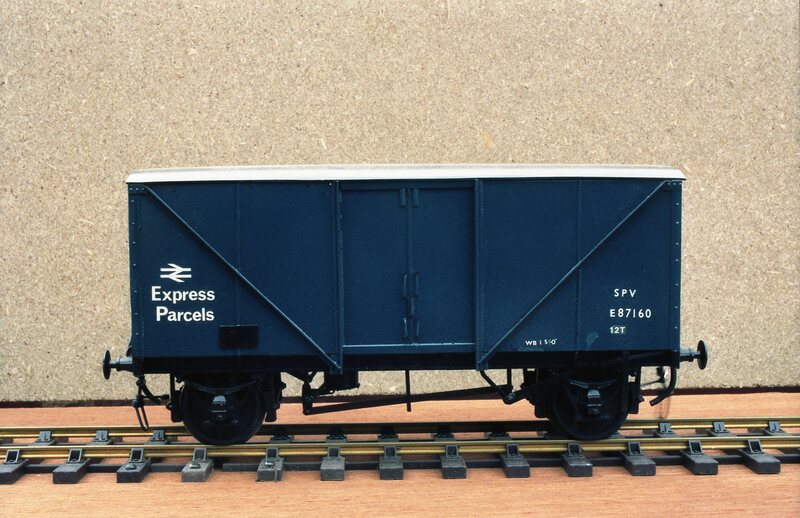 In this, one outer axle is fixed and the other two were on a hidden four wheel truck pivoted in the centre. These rode very well. Waiting to be lined out. The wood grain could have been a bit less prominent. 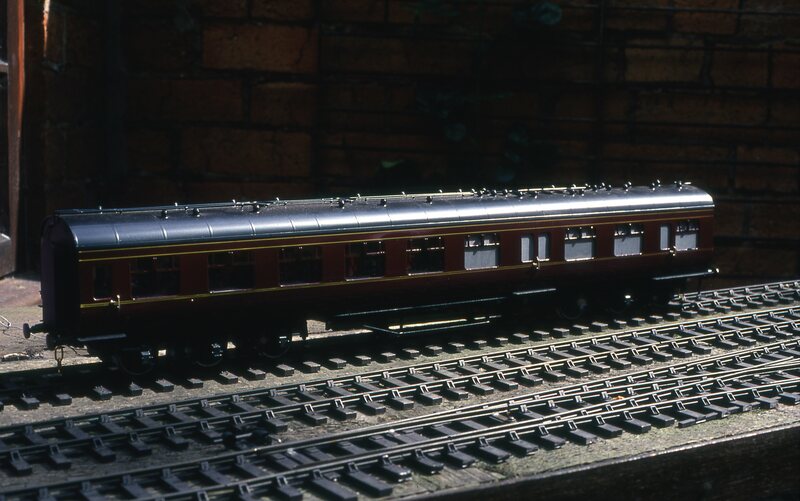 Now some coaches that I did not build were some LMS (London Midland and Scottish) period III coaches.